At VeloVoices we have a keen appreciation for anything or anyone who captures the beauty of cycling. The striking work of Maxine Dodd recently caught my eye. 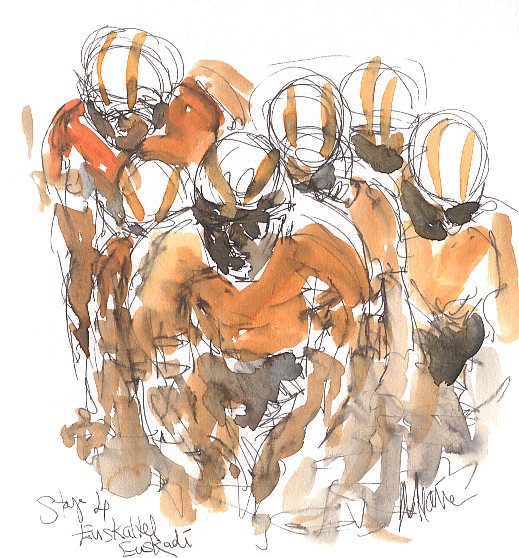 I love the energy, movement and atmosphere she creates with a few strokes of the pen and water-colour – an unforgiving medium. Maxine lives in the beautiful Leicestershire countryside where she finds daily inspiration. 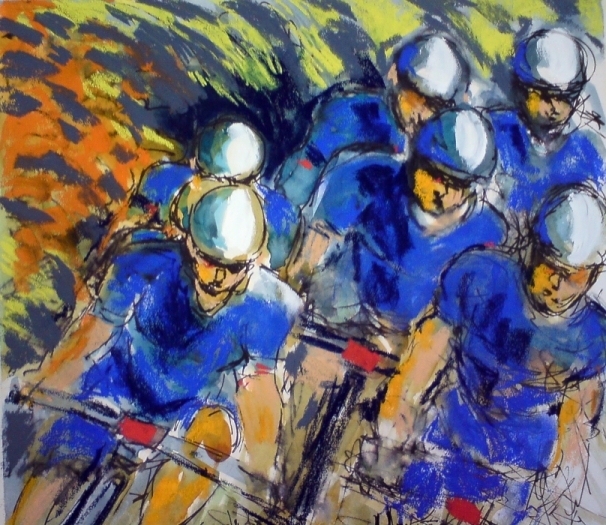 Here’s her story and a selection of her work which portrays her passion for cycling. Sheree: Let’s start by telling our readers more about you and your path to becoming an artist. Maxine: Well, I started early. I loved drawing and never grew out of it really. I always wanted to be an artist and studied art at college. Painting and drawing is my way of life. 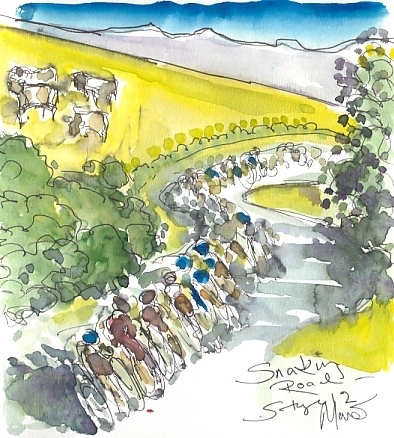 Sheree: Your blog ‘Racing Lines’ started with the 2012 Tour de France. Why was that so inspiring? Maxine: It was an amazing year for cycling and sport in general in the UK. Inspiration came easily! My drawing the Tour was a happy accident. I’d talked to friends about starting a blog as it seemed a great way to engage people but I wanted it to have a theme and focus that excited me. I started watching the Tour and decided to start sketching. After a few days, I had a Eureka moment and realised the Tour would be both a great theme and topic for my blog – just what I wanted! ‘Racing Lines’ was born. Few appreciated it would be the year of Bradley Wiggins. 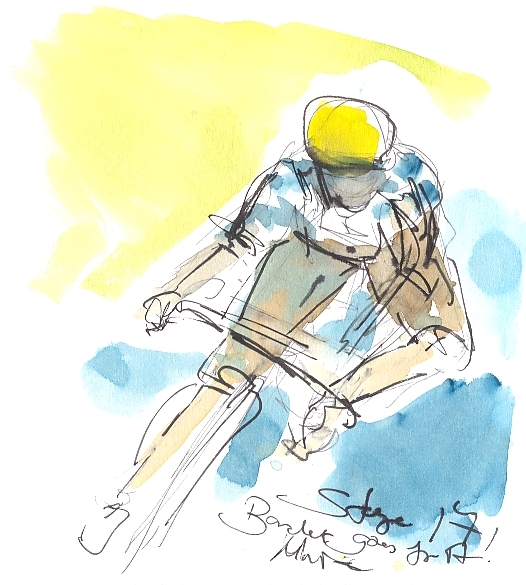 As the Tour progressed, the whole country was hooked, my drawings flowed and everything else went out of the window as he became the first British rider to win the Tour. The Olympics followed and I just continued drawing. It was momentous for UK sport. Cycling and Team Sky went stratospheric – just wonderful for the whole country. Sheree: You work in a variety of different media. How do you choose which one to use? Maxine: It depends upon the work and the time available to create it. Commissions depend on deadlines and my clients’ budgets. Oil is a slow medium for me and I like to use it even though drying takes time, at least six months to a year. But, when it comes to drawing, I just love pen and ink – you can’t rub it out or dither. You lay down a line and it stays, good or bad, you have to work around it. I find that very exciting and love to work quickly. 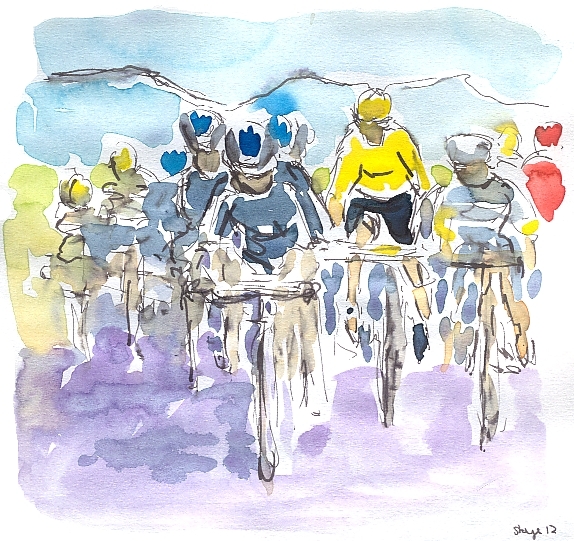 Sheree: How has your work evolved since you started painting bike races? 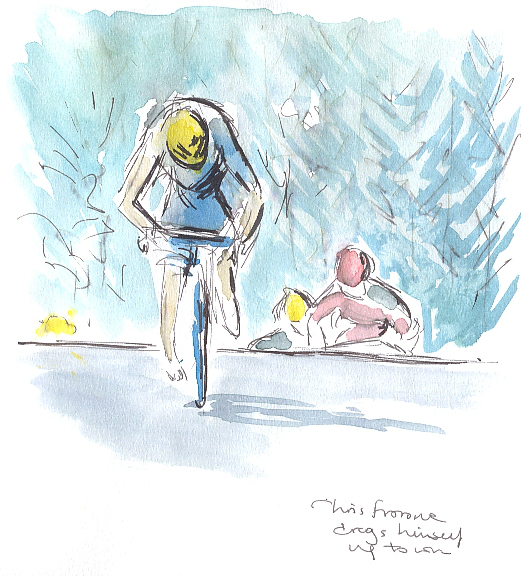 Maxine: I feel as though my work turned on its head when I started painting bike races. Prior to 2012, I used to paint either landscapes or figures moving but not in combination. Cycling brings these elements together wonderfully. 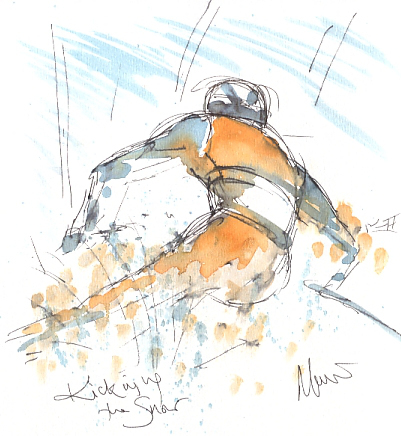 I have drawn other sports, including horse racing, sailing and even the Winter Olympics in Sochi – all of them featuring landscape and moving figures. But I keep going back to bikes, I just love the sport. I’ve followed the Tour off and on for years and still can’t get over what those incredible riders do every day – they’re amazing. My aim now is to create larger oil or mixed media paintings based on my drawings though haven’t yet decided how I want to go about it. They should be something new and articulate something apart from the drawings rather than just be a larger copy as such. The challenge is on and I have lots of ideas that I want to try over this winter. 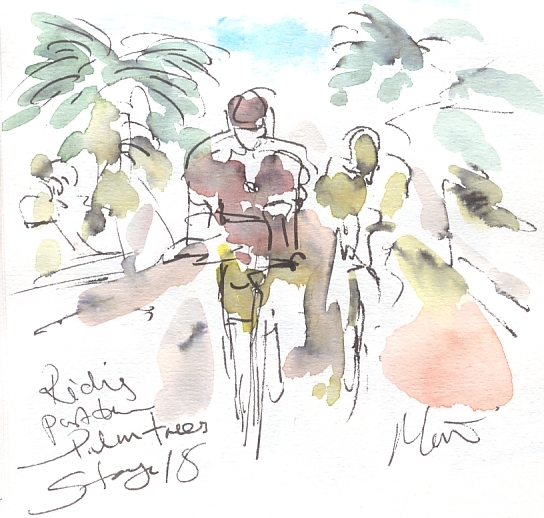 It will be great to paint colourful cyclists on a dark winter’s day in January that’s for sure! Sheree: Do you have a favourite race(s) and rider(s)? Maxine: I love the Tour but I’m also a big fan of La Vuelta. It’s an absorbing race and the weather, roads and terrain throw such a variety of challenges at the riders. This year was no exception. 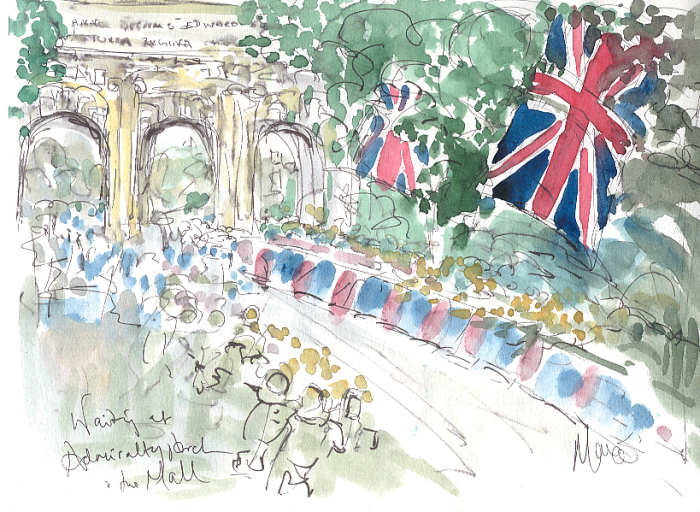 I also thought that the Grand Depart in Yorkshire and the RideLondon/Olympic events showcased the diversity and beauty of the UK and what a great following cycling enjoys here. There’s a strong argument to extend the Tour of Britain into a bigger event – although quite how you’d fit it into the calendar is another matter! I’m in total awe of all professional cyclists! Being British, I love Sir Bradley, Mark Cavendish and Chris Froome and it was great to see Geraint Thomas win his medal at the recent Commonwealth Games. I love to watch the big sprinters. Peter Sagan is great fun and lately I’ve been enjoying watching John Degenkolb and Nacer Bouhanni. But I’m also delighted to see the rise in status of women’s cycling and we have some amazing riders who are as talented out on the road as on the track. Laura Trott, Emma Pooley and Lizzie Armitstead are wonderful ambassadors for the sport and Marianne Vos is outstanding. It’s great to see women’s cycling on the up. Sheree: How do you decide what to paint? Is it a televised image, a photograph or something from your mind’s eye? If you are not skilful enough to sketch a man jumping out of a window in the time it takes him to fall from the fourth storey to the ground, you will never be able to produce great works. On many levels, it seemed such an extraordinary thing to say. But Delacroix was working before the invention of photography, so he had to possess that level of skill. Nowadays artists rely on photographs as an essential tool for their work, but I never forgot Delacroix’s words. In 2010, I was commissioned to record dance sessions in a primary school for children with learning difficulties. These wonderful sessions, which the children loved, could not be recorded in photographs and my commission was to create art that captured the spirit and joy they experienced when dancing together. I thought it would be impossible but remembered Delacroix and decided I must try. 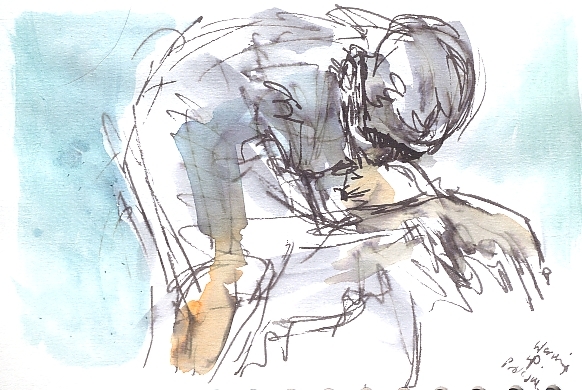 I took my sketchpad and used pens and crayons – the quickest materials – to draw eight dance sessions. The two completed works came from these real-time, fast-moving drawings. 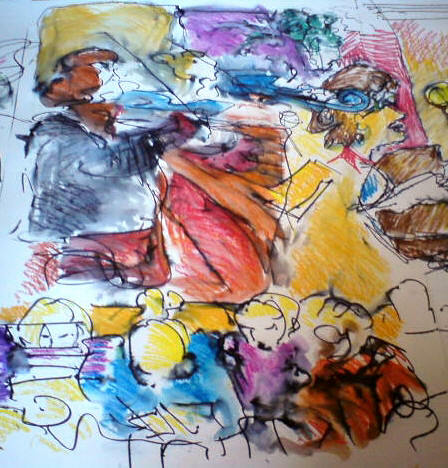 A year later, I undertook a similar project with the Kettering Symphony Orchestra, drawing them at rehearsal which helped further refine the style of my drawings today. 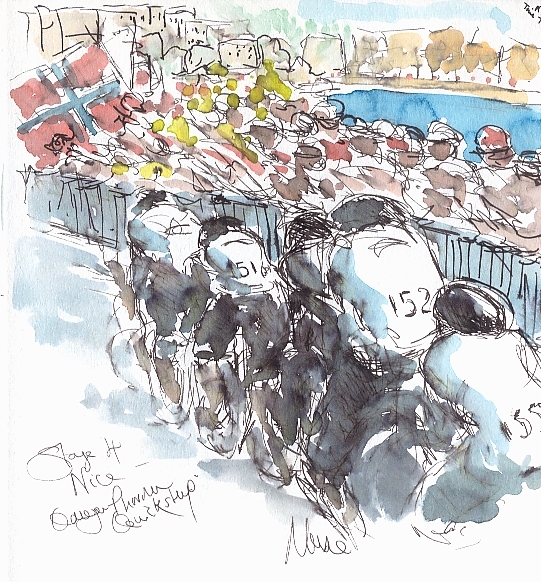 So, in 2012, Delacroix’s words were once more uppermost in my mind when I sat down with my sketchbook and pens for that first stage of 2012 Tour de France to record what was unfolding in front of me. I really love this challenge; it keeps me on my toes! I record the transmissions in case I need to go over them again, but rarely do. I watch, draw what I see and move on. I publish the better ones and some go into the bin. I just love the chase! Sheree: This is the best bit! Which are your favourite works and tell us why? Maxine: Well, this is hard! I’m never completely satisfied with anything I do! Most artists think they can do better, it’s part of our temperament. There are some that stand out for different reasons. 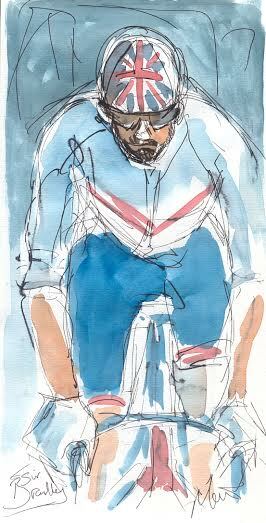 One of the first drawings I did was of Bradley Wiggins warming up before the prologue. He has very distinctive hands (like Chris Froome’s elbows and Peter Sagan’s thighs!). I can often spot him by looking for his hands. I don’t think this picture is a brilliant likeness but the hands have something about them that are like Sir Bradley’s. Sheree: Love this one of Froomey looking at his stem! Maxine: I agree Sheree, he dragged himself up that hill to win the stage. The same hill featured again in this year’s Tour. I recognised it immediately knowing that I’d drawn it two years ago! 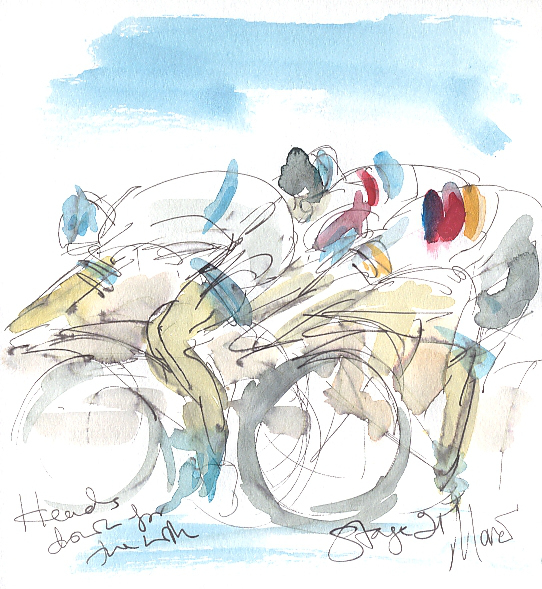 I love seeing sprinters surge for the line and there are a couple of paintings where I hope I’ve captured this well. 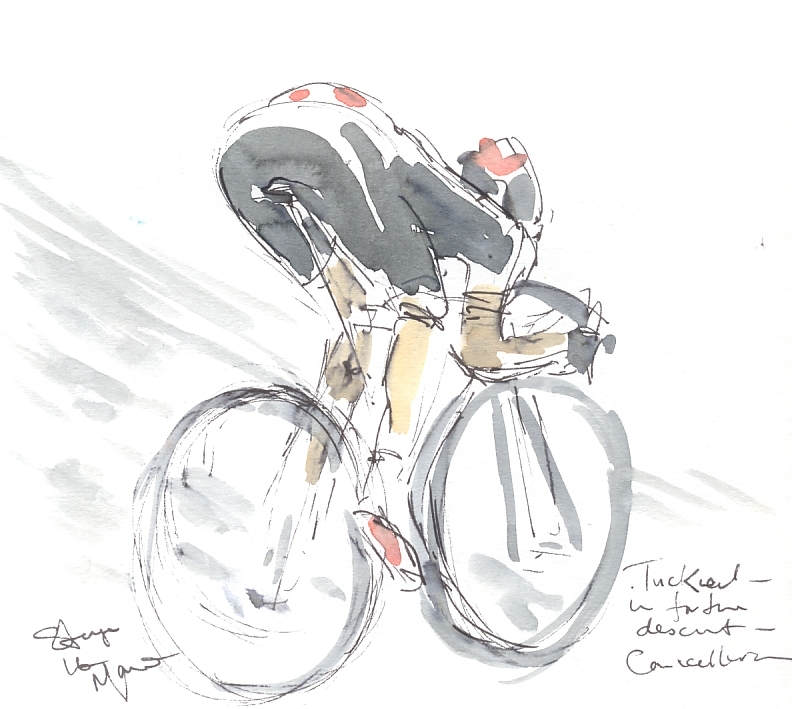 I love to draw the angles of the bikes that counterbalance the angle of the rider. It’s also great to get a side view, when heads are down, desperate to get there first. 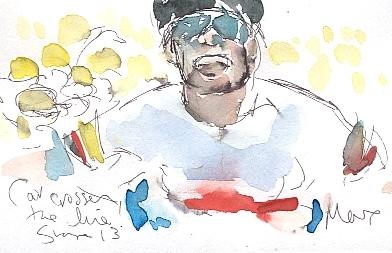 Again, Mark Cavendish has a very recognisable style on the bike and I think that I came close to capturing it. One of the key attractions of cycling is the colour and I really enjoy the team sprints and the team time trails for that reason. The riders are like F1 car engines, riding so smoothly and so fast together; just wonderful to see. Sheree: I love the vivid colour created by the use of pastels. Maxine: Thank you! Pastel was my first love and I love to use it in combination with other media, such as acrylics to give emphasis and drama. Pastels are pure pigment and when they crumble, the colours are wonderful. I like to get my hands dirty! Sheree: And, of course, this picture brings back very fond memories of the Carrots – gone but not forgotten. Maxine: Weren’t they great? One of my favourite teams, definitely not forgotten! I also love ‘Mud Riders’. It’s a bit of different style for you? 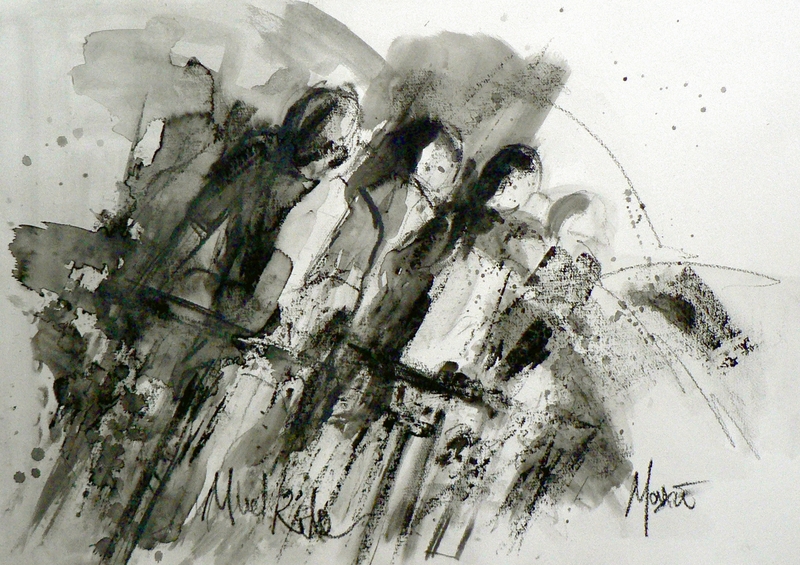 Maxine: It is – part of my exploration into making images inspired by cycling but developing them further and larger. I wanted to convey all the spray and mud from the road. I made it using water-soluble graphite and pastel which suit the subject matter well. A gritty medium but behaves like watercolour when wet – very nice and I want to do more! Sheree: Do you have any forthcoming exhibitions or cycling-related projects that you can share with our readers? Maxine: I’m preparing for another solo show next year timed to coincide with the Tour de France. 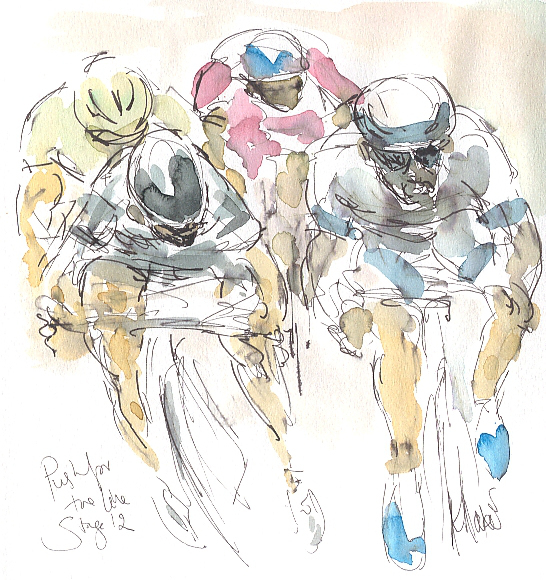 I’ll be working on further developing the cycling drawings over the winter and I have a book in the pipeline based around my ‘Racing Lines’ blog which will coincide with next year’s exhibition. Sheree: Good luck with those and many thanks for your time. It’s been great chatting to you and learning more about your work. Check out Maxine’s blog (http://maxinedodd.com), her Facebook page Maxine Dodd – Artist and her website www.arial-online.co.uk where you can see and buy her paintings, plus find out more about her work. (All pictures copyright of Maxine Dodd). It was our pleasure! I really enjoyed getting to know more about you and your work. That’s good, we like smiles!